The poet Thomas Digges quotes in his Prognostification Everlasting is Marcellus Palingenius Stellatus whose book Zodiacus Vitae was published around 1530. Marcellus died sometime after this but we don't know exactly when. What we do know is that Pope Paul IV declared the work heretical in 1559 and for good measure ordered that Mercellus'es bones were to be exhumed and burned just to make sure he did not write any more heretical texts from beyond the grave!! I have not studied Latin since school about 45 years ago but my loose translation of the lines Thomas Digges quoted is below. "All things that are above the Moon are good and last eternally, no sorrow can trouble these celestial places. Whatever is under the Moon is ill and feels the severe law of mortality and is eaten by the force of time." 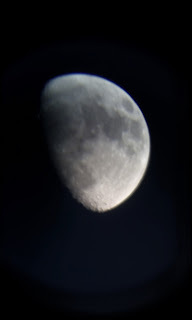 Here is the Moon captured a few weeks ago through my Tudor Telescope. It can be seen that the surface of the Moon has clearly been troubled by a few collisions with meteors over the years. Just as Galileo saw with his perspicillum in 1610 a few light spots can be seen in the dark areas. Before Galileo these spots might have been thought to be due to Hecate and her torches. Galileo simply attributed them to high features that caught the light of the sun better than the lower surrounding areas.